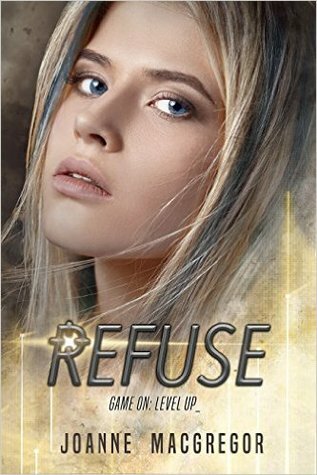 Refuse by Joanne Macgregor is the second book in the series and it picks up straight after Recoil ended with a cliffhanger. At the end of Recoil, Jinx has tranq-darted Connor (her boyfriend Quinn's brother) and helped Quinn to escape, while getting herself captured. She was taken to an interrogation centre and things got nasty there. While she was there, she discovered that Connor was also at the same facility and somehow she managed to find and memorise the location's address. After Jinx's thorough interrogation, she was released to go back to ASTA. She's seen what they are capable of but decided to stay and find out more about ASTA and the government. She also managed to get Connor's location out to the rebels, not without help though. She made an unlikely alliance with Sofia, who was in the same Intel unit as Quinn, and together they discovered several things that made Jinx decide to leave ASTA for good. Jinx really misses Quinn and knowing he was somewhere safe with the Rebels, she decided to reach out and join them. She was not welcome at the Rebels camp but the leader Zonia decided Jinx is useful with her Sniper skills. Quinn was still mad at her for darting his brother but after a long while they found their way back together again. Zonia used Jinx's brother Robin to threaten Jinx to do her bidding but Jinx refused. Jinx knew how much everyone at the Rebels camp hated her (except Quinn) and knew she was putting them, especially Quinn, in danger by being there. At the end, something happened to Robin and Jinx was forced to once again face ASTA and the government. This time, Jinx has decided there is to be no more running away and she will face them bravely, with Quinn by her side. I absolutely loved Refuse and alongside Recoil, these are becoming my top books of 2016. And Joanne Macgregor is such a talented writer with an excellent style that I love; she's fast becoming one of my favourite authors too!